Is it me or does Tom Cruise look a bit… tired? 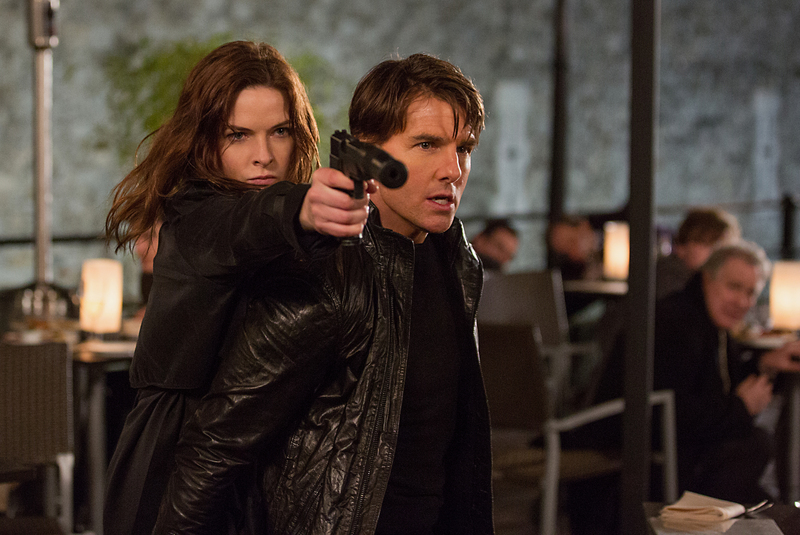 The more I watched this fifth installment in the popular Mission: Impossible series, the more I couldn’t shake the idea that at this point in his career, Cruise is just, well, cruising. Sure, as globetrotting secret agent James Bond, er, Ethan Hunt, he’s always this close to death: Precariously hanging from the side of a plane in Belarus, fighting assassins in Austria, and chased by high-speed motorcycles in Morocco. But for some reason he just seems kind of bored by it all, even if he famously performs his own stunts. Or perhaps it has something to do with franchise fatigue. The previous assignment, 2011’s Mission: Impossible – Ghost Protocol, was surprisingly fun and exciting, the best entry in the series since Brian De Palma’s original Mission: Impossible in 1996. This time around, I didn’t get any sense of high stakes, no matter how much Cruise raced, jumped, or kicked his way out of trouble. Sure, it’s still fun and there are some cool stunts here and there. But it doesn’t remotely approach the first film’s dizzying infiltration of CIA headquarters or Ghost Protocol‘s climbing of the Burj Khalifa skyscraper, both sequences that crackle with danger and claustrophobic suspense. Come on, Tom. It’s time to up the ante.